Asked Questions - or even making money from "Sunclocks" ! Alternatively, the 'Sitemap' page would give you more options. for each of them), are shown within the 'Picture Gallery' on our web-site. You could also click on any of the pictures, above, for more information. sundial plans, plus which are specifically 'customized' to each location. 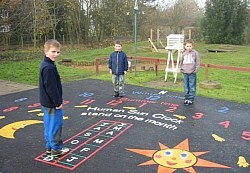 up any playgrounds with a useful (plus vandal-proof) feature ! and demonstrates Seasons slowly changing through the year. look forward to a School Re-union, on some date in the future. also devise their own set of 'games', based around the layout. way to cover several requirements of the National Curriculum. 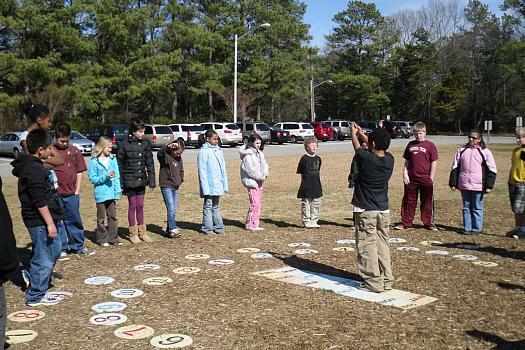 have an outdoor educational project showing basic principles. their own shadow, before the school makes a real "Sunclock". 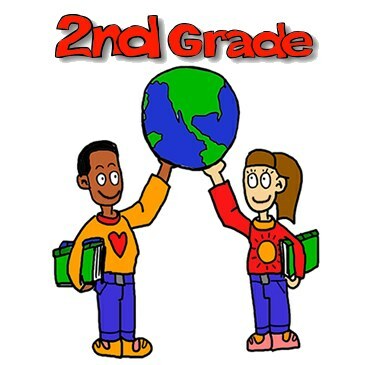 the picture below to find other projects aimed at "2nd Grade". or alternatively use more permanent thermo-plastic markings. 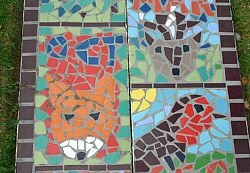 it is also ideal if you want an interesting 'Art and Craft' project. each of the students, to be used as accurate 'working models'. stick it on to a piece of stiff cardboard using suitable adhesive. (which would illustrate the varying Seasons, month by month). plus you can also see an example on our 'School-books' page. that both the rings of Hour-markers are elliptical (not circular). different - with Hours being in the 'anti-clockwise' direction ! example: Schools, Gardeners, plus Architects & Landscapers. creating an expanding 'chain-reaction' effect, of more orders ! plus you will make even more money by producing any 'kits'. plus often used for Eagle Scout projects in the United States. very colourful feature that is also functional and vandal-proof. are more details, on our "Frequently Asked Questions" page. 6 am until 9 pm, during any 'Daylight-saving' part of each year. see the "Frequently Asked Questions" for further information. stepping stones, (but obviously won't tell time after sunset) ! some examples are illustrated in the two photographs, below. can obviously select your own subject, plus the colours used. 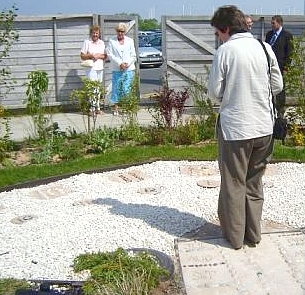 'Human Sundials' are also popular as unique garden features. 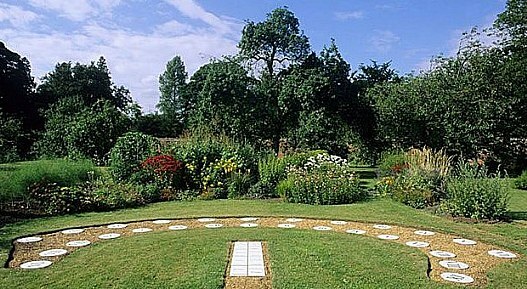 mention that well-known Stately Homes have a "Sunclock" ) ! locations such as "Chatsworth House", plus "Longleat", (UK). on the lawn at a house in Loughborough, Leicestershire (UK). 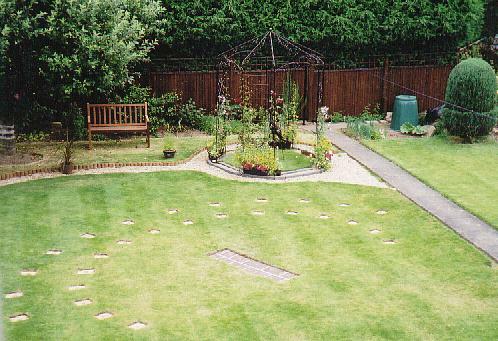 picture below shows one at "Westacre Gardens" (Norfolk, UK). 'gravelled' area, so this will need absolutely no maintenance ! By coincidence, it is also in Leicestershire, UK - at Gilmorton. 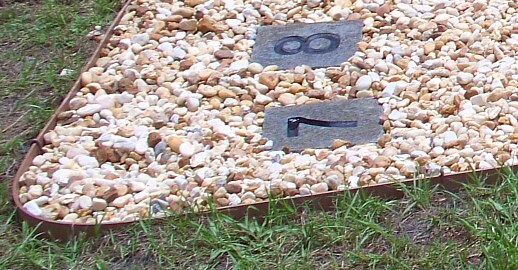 gravel is 'contained', by means of an "edging strip", around it. this particular layout is located at Lauderdale Lakes, (Florida). need no maintenance, means they are ideal for public areas. 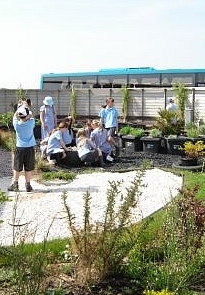 in the "Energy Garden", on the esplanade at Southport (UK). Our professional category has more 'sea-front' photographs. wider than we usually suggest - but making the "Sunclock"
much easier for any disabled people to use, in a wheel-chair. you can return to our 'Picture Gallery', by clicking on this icon. Click on Red Button, to return to FIRST PAGE. Response Form - or click on this link to see why "Sunclocks"
have become so popular, when compared with other sundials. whose sundial plans have been in use world-wide since 1986.
and give some advice suited to your personal circumstances. 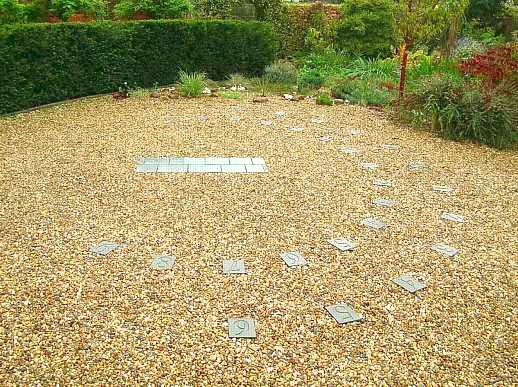 as well as courtyard sundials at prestigious "Stately Homes". 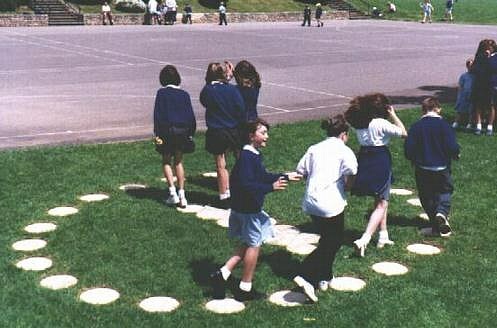 due to many 'curriculum-wide' aspects, of a Human Sundial ! 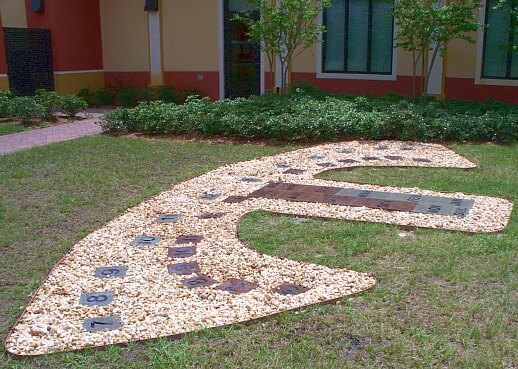 (including 'fund-raising') of these novel sundials for learning. stolen, plus it does not interfere with grass-cutting of a lawn. so you can be sure that they will indicate correct clock time. when compared with most of the other 'conventional' types.